Part of the article about his mustache Phoenix takes a sip of tea. "And when you tell them about the new mustache," he adds, "that might put a damper on things." Phoenix stepped into his role very late in the game, a couple of weeks after production began. Though the character factors heavily into the film's suspense and drama, he also provides a major portion of the comic relief. "I don't think I want to be a comic relief actor, but I just want to try everything, give everything a shot," says the usually reserved actor. "And this certainly presented the opportunity for me to play a role that was more fun, not as serious. I didn't get arrested or kill anybody, so that was really good. It was exactly what I wanted in terms of the character. I'm very fortunate that way. I couldn't really specifically say what character I wanted to play or anything like that, but I get a script and that's it. I chalk it up as another experience, another character." Signs was also an opportunity to work with another top-flight director. "Night is really unique and an amazing director and kind of an ideal director in many ways," says Phoenix, who's taken his cues from Ridley Scott, Gus Van Sant and Philip Kaufman. "What's nice about him is he's very inclusive on set with the cast and crew and (also) with the audience at large. I think he generally wants everyone to enjoy this movie, but he never sacrifices his personal vision of what he thinks is interesting. It just so happens that he blends those two things effortlessly together. I think that's pretty rare. Closing Date: August 31st, 2002. Winners will be contacted with dates of screenings on September 6th at FilmFour in London. The folks at Gorilla Entertainment have announced a release date for Buffalo Soldiers. The email said... "ProKino/Fox will release Buffalo Soldiers in Germany on 31st of October 2002. The UK release has been postponed until end of the this year as the UK distributor Film 4 is going out off business. A new distributor will be announced in September with a firm date for the UK opening. Miramax has scheduled the US release for 1st quarter 2003." understand things haven't changed. So, the film looks just 'blahish', very bland... I haven't seen any work reels but from what I've heard from people who have it's nothing to gloat about. Especially after working on Lilo. As I said before, the story didn't have the incubation time to cook that it needed." According to 'Olivier' who got to visit a Disney Feature Animation Studio in August 2002, the project was recently renamed Moments. While sending a romantic poem to his girlfriend by computer, a thirteen-year-old computer genius (Leaf Phoenix) accidentally sets off a sequential code which activates secret military weapons. The military can not stop the nuclear chain of events once it has started. The only hope is to call on Superboy, who flies the boy genius to a secret submarine where the missiles are ready to launch. With time running out, the boy decodes the computer while Superboy uses all his super-powers to deactivate the nuclear missiles. But unless they can finish in time, it may be the beginning of World War III. 09-08-Phoenix got himself a new agency, but still is co-represented by longtime agent Iris Burton. HOLLYWOOD (Variety) - Joaquin Phoenix, currently starring opposite Mel Gibson in M. Night Shyamalan's sci-fi suspenser "Signs," has signed with the Endeavor Agency. He was previously represented by Creative Artists Agency, and remains co-represented by longtime agent Iris Burton. After receiving sound reviews in 2001 for back-to-back perfs in "Gladiator" and "Quills," thesp was a top kudos contender that year, nabbing Oscar, Golden Globe and BAFTA nominations for the former and earning a Broadcast Film Critics Assn. win for the latter. Phoenix next stars alongside Ed Harris and Anna Paquin in "Buffalo Soldiers" and in Thomas Vinterberg's "It's All About Love" opposite Claire Danes. Rory, the brother of actors Macaulay and Kieran Culkin, hung out with Joaquin Phoenix on the set. Joaquin, who plays his uncle, hails from a similarly talented family of actor siblings. The two have kept in touch since they finished shooting. Phoenix: "Keeping an open mind is a challenge for believers and non-believers alike. It's hard to say whether we'll ever find an explanation for crop circles that truly satisfies everybody. 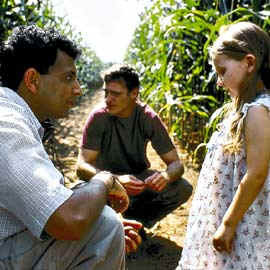 In my new movie 'Signs', crop circles are explained in a very visual way. And although the film doesn't propose to present you with the facts, it does raise the interesting question: Just what do you believe? We're in the high season for crop circles. They're springing up in fields all over the world right now. Sometimes several are reported in a single day. No matter what you think, they're always worth a look. For the History Channel, I'm Joaquin Phoenix, and I'll see you at the movies." Announcer: "Everybody wonders about these weird circles in the fields. Well, they just appear overnight. Yeah, and they show up all over the world." Phoenix: "But where exactly do they come from? And are they an elaborate global hoax? Or a sign from alien visitors? I'm Joaquin Phoenix. These questions challenge the characters in my latest film, "Signs." The movie, much like reality, will leave you to draw your own conclusions. What do you believe?" Announcer: "The story of crop circles. It's 'Incredible, But True.'" Looks like ABC&Entertainment are auctioning off quite a few Signs props... the baby monitor set bid is currently $362.00, the blue jersey worn by Graham Hess is currently $305.00, the maroon t-shirt worn by Merrill Hess is currently $272.00, the basement radio is currently $255.00, and the jeans and t-shirt worn by Graham Hess is currently $224.72. For complete information on eBay's Terms and Conditions, please refer to their Conditions of Sale page.